Y'all know how I am obsessed with dragonflies, so you won't be surprised that I'm posting another photo of one of my beloved dragons. Besides... I told you earlier this week that one of the dragonflies I photographed last weekend was a "lifer" for me (meaning it was the first time I had ever photographed this species). So, it's only fitting that I share the "lifer" photograph with you... right? The dragonfly in the above photo is a Spangled Skimmer dragonfly, and, let me tell ya, it's a beauty! Those white spots on the wings just flash and shimmer when it flies around, causing it to really catch your eye. I had been watching this species of dragonfly fly around my pond, but they wouldn't sit still long enough for a photograph. I was absolutely thrilled when one finally sat still... even if it did require me to do some fancy leaning and standing on my tip-toes to get the photo. It was worth it! Nope, this photo won't be going in the recycle bin composter. It is one of my current faves now. Wonderful, Misty. It's gorgeous! Congratulations on your fancy leaning and tippy-toeing to get the shot. Great shot! I find dragonflies can be hard to capture, photography-wise, although I did manage to get some shots a few weeks ago (posted for a previous Camera Critters post). Congratulations, it's a beautiful picture. Your dragonfly's fragility makes me think of our life's fragile state in today's world. Such a wonderful shade of blue and such a fabulous shot. You do love photographing dragonflies, don't you? This one has such a wonderful coloration. Photo well done. BOBBLEHEAD HERON Come by and see!! Very good and nice macro. It is very beautiful with those silky wings and colorful body. I would like to take some photos of them too but never see them. Your photo is wonderful, worth any acrobatic pose. Beautiful dragon, Misty...congrats on the lifer! Very cool that you photographer a new species! Beautiful dragon fly..and I love the name. Great shot! And, long time no see!! 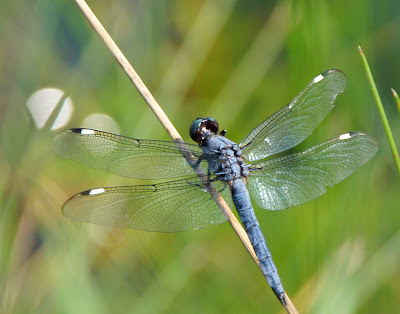 It is easy to see why this dragonfly is a favorite. I NEVER see them so I really enjoy your photos! Misty, congrat on your new dragonfly. It is a beauty, great photo. What a wonderful capture, he is a beauty. Congrats on the photo. What a beautiful photo, Misty! I think these are my favorite dragonflies, but haven't been able to capture one yet this year.